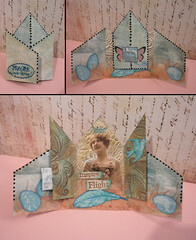 This ATC was made for our Open House Triptych swap at North Coast Art Swaps. This one probably took the most time, I think it was because I couldn't really decide what I wanted to do. The background paper started out as some leftover serendipity paper I had made for a swap about a year ago. Most of the stamped images are from Stampington Company, some are also from Inkadinkado. I think I found the lady image in the free collage images at art-e-zine. I have uploaded the triptych templates that we used to North Coast Art Swaps, or you can download the PDF here. Thank you so much for this post. I want to let you know that I posted a link to your blog in Creative Busy Hands Cricut Freebies Search List, under the Card post on Apr. 02, 2010. Thanks again. Wow, gorgeous, just utterly gorgeous!